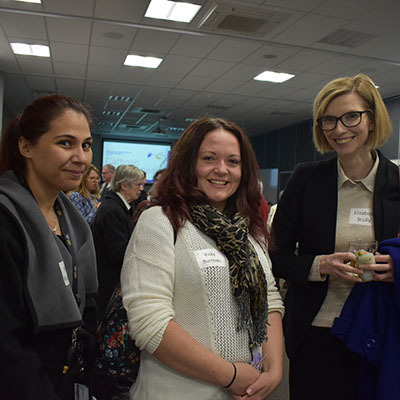 Sixty women and men from Parramatta Diocese and beyond gathered last week to discuss the critical place of women in the life of the Catholic Church and the need for the female voice in leadership. Our Lady of Mercy College, a school deeply committed to women’s participation in Church and society, was a fitting venue for the evening of formation and consultation with the Council for Australian Catholic Women. Addressing the Catholic Women Speak event, Cristina Gomez from BBI-The Australian Institute of Theological Education introduced key women from Church history and highlighted the expectation through the centuries for women to be wife and mother. As well as the women saints, Dr Gomez honoured the contributions made by unnamed women through to the present day in parish and other Catholic settings. The animated discussions revealed the people gathered were keen for women to be given leadership roles in the Church that have real authority, for inclusive language to be part of liturgy, for genuine collaboration between priest and parishioners, for women to give reflections within the Mass and for the Church to take the lead in eliminating sexism and discrimination against women. Envisioning a Church for the next generation, the group called for less legalism, as well as more accountability for bullying and bad decisions. Pioneering new ways of relating, ministry, sharing wealth, community, economy and decision-making are the ideals for a Church of the future. Some asked about the possibility of the ordination of women. Feedback from the consultation will contribute to research within Australia and internationally on women’s participation in the Catholic Church. The successful event was organised in partnership with Catholic Women’s Mentoring with the support of WN Bull Funerals and the Australian Catholic Superannuation and Retirement Fund. This entry was posted in Uncategorized on June 28, 2018 by ACBC Communications.